Tom Brady ... as if you didn't know. a: The best quarterback in the history of the National Football League. c: Husband of supermodel Gisele Bundchen. d: Owner of five Super Bowl rings. e: Most fiercely competitive athlete in America history. 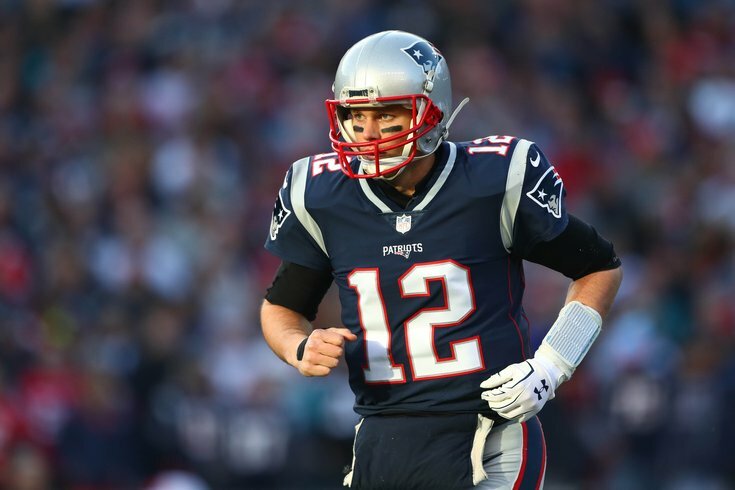 The answer probably is all of the above, but there is a time for all reigns to come to an end, and the beginning of Brady's fall from the top of the mountain could very well happen against the Philadelphia Eagles – and some of that fall might be of his own doing. At the age of 40, Tom Brady will march on to the field in Minneapolis on Sunday night, wearing the familiar Number 12 on his white uniform, and attempt to win his sixth Super Bowl. Let the numbers sink in - he is trying to win his SIXTH Super Bowl ring. Forty years old. It says here that it's not going to happen. If given a ballot to vote for the Greatest of All Time, this typist would have Brady at the absolute top of the list. However, nobody can hold off the pursuit of time, and Brady will have an even greater problem when a guy named Fletcher Cox and his mates try to make him feel every bit of 40 years old once the Super Bowl starts on Sunday night. The Patriots will enter the game as favorites against the Eagles, a credit mostly to the resume and reputations of Brady, coach Bill Belichick and tight end Rob Gronkowski. After all, the Patriots have been there before, and it is the Philadelphia Eagles who are supposed to play the role of golly-gee mostly first-time attendees. It is the Eagles who pre-supposed to get caught up in all the distractions, while the Patriots go about a connect-the-dots ritual they have followed through so many Super Bowls, including the one more than a decade ago against the Eagles. The fact that the same quarterback/coach combination is still in place for New England borders on unbelievable, but there is no such thing as never-ending glory in professional sports. If Brady doesn't have a deal with the devil, he certainly does have some sort of deal with his fitness guru, and his fitness ritual has become as much an infomercial as a documentary. Want to live like Tom, how about a TB 12 nutritional manual for about $200.00, or a Facebook documentary that is playing out as a prelude to this Super Bowl. How about an association with personal trainer et al, Alex Guerrero, that seems to even go beyond his association with the team's medical staff. Brady has done a wonderful job of balancing his duties as a teammate with his own personal trainer. However, this season has been just another stressful situation because none other than Belichick minimized Guerrero's status with the team. Granted, Brady has already laughed in the face of the whole Deflategate fiasco and made a mockery of the NFL's idiocy when he won yet another ring. There have also been the past accusations of cheating, which Brady and the Patriots simply sweep away behind the mantra of "They hate us, cuz they ain't us." This week, there were the disgusting statements by a radio host in Boston who made disparaging remarks about one of Brady's children in reference to the documentary currently being presented via Facebook. One thing after another, after another. And yet he finishes on top . . . until . . .
Until some team comes along and makes Tom Brady feel 40 years old, and makes the New England Patriots wonder if they can crank it up for another dramatic victory. Make no mistake, when the Patriots play in the Super Bowl there is usually drama, with all of their appearances winding up as three-point affairs or overtimes. They have been beaten by the New York Giants in nail-biters than ruined perfect seasons and won a couple when the opponents such as Seattle or Atlanta simply melted under the glare of Brady and Belichick. That will not happen to the Philadelphia Eagles. The Eagles will arrive on the field in Minneapolis with all due respect and preparation for the Patriots and Brady, but no fear. Again, they will arrive as an underdog, and with a backup quarterback Nick Foles who wasn't even sure he was going to play this season. Foles against Brady? Laughable, right? How about Bambi vs. Godzilla? Foles might not have the eye of the Tiger, but he has enough tigers on offense to give him a chance to beat the Patriots defense. Foles has a variety of weapons to deploy against New England, and during the entire season coach Doug Pederson has used about every weapon at his disposal. Some of this has been through necessity as the Eagles have been hammered by injuries to key players, culminating in the loss of quarterback Carson Wentz, yet somehow they have maintained their momentum and arrived in Minnesota. The Eagles and Foles are an underdog with nothing to lose, a quarterback coming off a remarkable playoff victory, a kicker who can boom game-winners from over 60 yards – and most importantly, no fear of Brady and Belichick. And by the time this is over, the guess here is that Tom Brady is going to be wondering if the same week that 40-year-old Jaromir Jagr's amazing career has apparently come to an end, maybe the end of Number 12's claim to the top of the mountain isn't also at its end. There is a chance that Sunday night's game is just further evidence that Brady is head and shoulders above all others, but the guess here is that Brady's head and shoulders will be on the turf through the game - and the new empire will be evidenced with a parade down Broad Street next week.